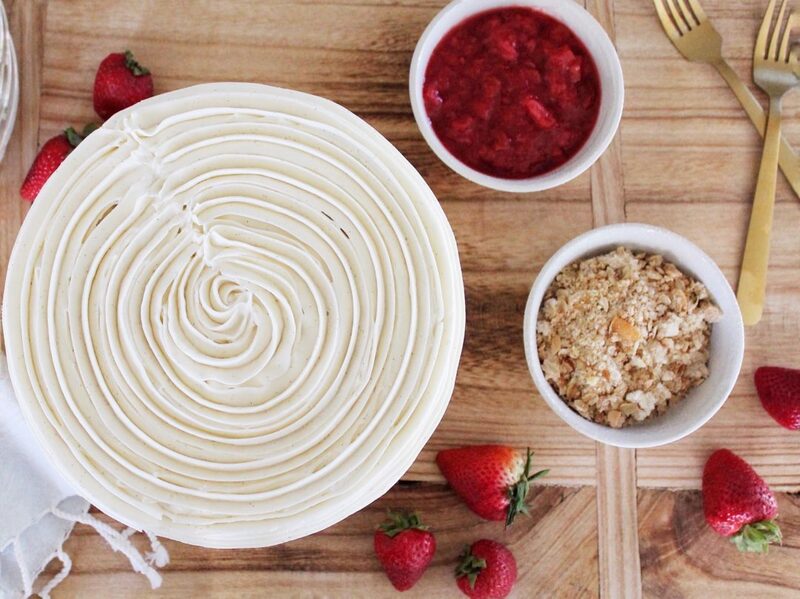 Sign up for cake recipes and blog updates straight to your inbox! Be the first to know about exclusive Cake by Courtney deals and announcements. Sign up here! Feel free to email me at [email protected] if you have any questions or fill out the form below! Inspired by one of my favorite summer desserts, my new Strawberry Rhubarb Crumble Cake is the perfect cake to take you into summer. Summer is officially here and I can’t think of a better cake to take us into the season than this Strawberry Rhubarb Crumble Cake! This cake is inspired by one of my favorite desserts Ryan’s parents make every summer. Based off Bon Appetit’s Strawberry and Rhubarb Crumble, my new cake has tender white cake layers, a strawberry and rhubarb filling, a cinnamon oat crumble and a whipped vanilla bean buttercream. If you want to make this cake, this is the time to do it. Rhubarb is ripe and in stores now. 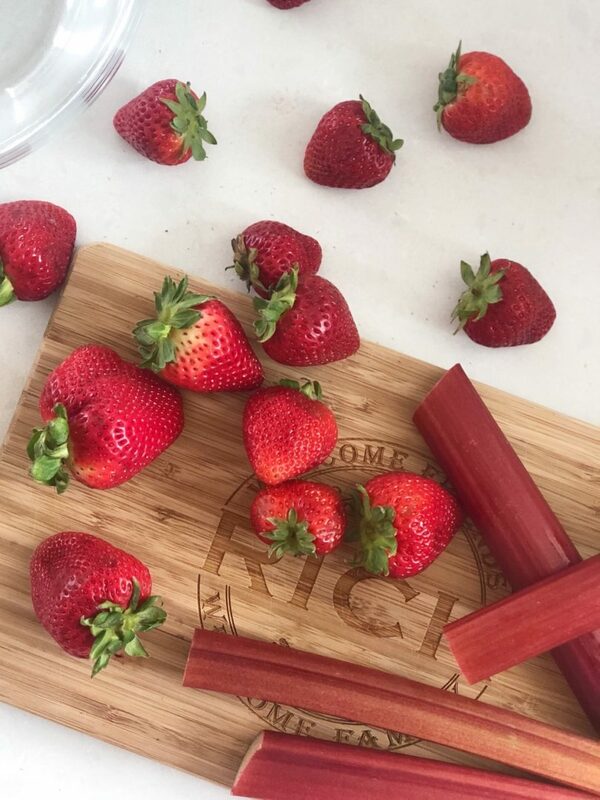 When you’re buying your rhubarb, look for the brightest red pieces you can find. Of course, with any of my fruit filled cakes, if you can’t find fresh seasonal fruit, you can always use frozen fruit. If you do use frozen fruit, let the fruit thaw a bit and pat with a paper towel to remove some of the excess moisture. The strawberry rhubarb crumble from Bon Appetit has been a favorite of mine for some time now. It’s a treat I look forward to every summer we visit Ryan’s parents. I actually first made a cake inspired by it a few years ago, using Tessa Huff’s recipe for her Riesling Rhubarb Crisp Cake. I loved her fruit filling and oat crisp, but wasn’t wowed by the swiss meringue buttercream. But, if you know me, I never like SMB. It just lacks flavor and is always hit or miss if I make it right anyway. (Anyone in that boat with me?). So for my version of this cake, I decided to use my whipped vanilla bean buttercream from my Peach Crisp Cake. It’s my version of an American buttercream. I say “my version” because I always add heavy whipping cream to my buttercream and beat the buttercream on medium-high for about five minutes (two steps you usually don’t see with most AB recipes). This helps create a much lighter texture, similar to that of a SMB. I also love that this particular buttercream kind of tastes like vanilla bean ice cream – something we always serve on a warm crumble! For the fillings, I slightly adapted Bon Appetit’s recipes to mimic their dessert the best I could. You’ll notice in the recipe that both filling recipes make quite a bit. I like making a lot of filling so I always have some to serve on the side with each slide of cake, just in case people want more (which they always do!). You’ll see in the picture above, my filling mixture is quite fine. I think I over-mixed the filling and would recommend stopping when you achieve slightly larger clumps. And then for my cake layers, I used my classic white cake as a base and added vanilla bean paste. It’s light and tender and compliments all the flavors so well. With this cake, because there is a soft filling, you want to take a couple extra steps when you stack and decorate. I’ve included a short video below to give you a visual of what I list above. These steps are also included in my assembly instructions below. For the swirls around the cake, I used the Wilton 1m tip. I love how simple this look is to create! Can’t wait for you to try this one! Here’s to a great summer! 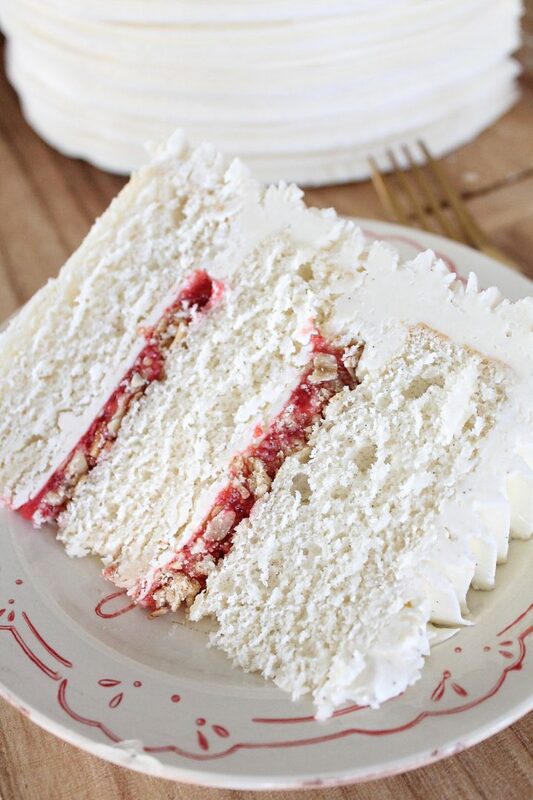 Tender white cake layers with a strawberry rhubarb filling, cinnamon oat crumble and whipped vanilla bean buttercream. Preheat your oven to 350 degrees. 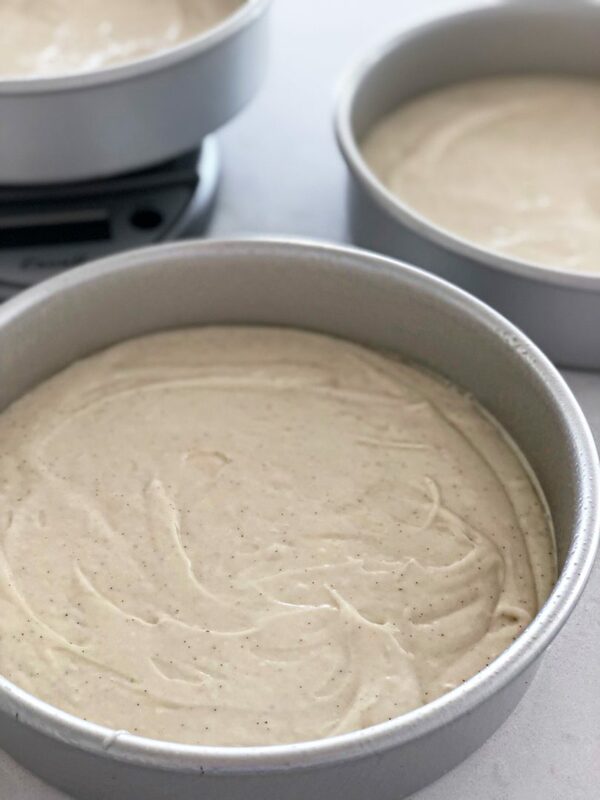 Spray four 6-inch round or (three 8-inch round baking pans) with nonstick spray, line the bottom of each pan with parchment paper and spray again. Set aside. In a medium bowl or measuring cup, combine and stir the egg whites, whole egg and the vanilla. Set aside. In a bowl of an electric mixer, fitted with a paddle attachment, combine the dry ingredients together on low speed for 30 seconds. Add the butter one piece at a time, about every 10 seconds. Once all the butter is added, pour in the buttermilk and mix on low for about 1 minute, until the ingredients are incorporated. 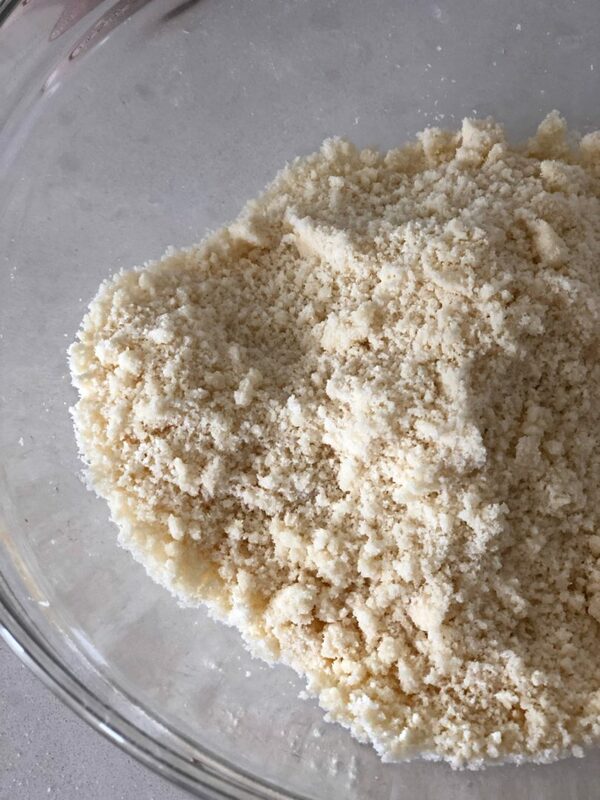 Scrape down the sides of bowl and begin to add the egg mixture in 3 separate batches, mixing on miedum-low until light and fluffy, about two minutes. Fold once or twice to ensure the batter at the bottom of the bowl is incorporated and mix for another 20 to 30 seconds. Using a kitchen scale, divide batter evenly among your pans (about 15 to 16 ounces of batter in each of the three 8-inch pans, spreading evenly with a small offset palette knife. Bake until a cake tester or toothpick comes out with a few crumbs when inserted into the center, about 20 to 25 minutes. Check cake at 20 minutes and then set the timer for 2 to 3 minute intervals if the cake needs to bake longer. You're looking for a few moist crumbs to come out on the toothpick when inserted into the center of the cake. Let the cake layers cool on racks for 10 minutes before inverting onto greased wire racks. Gently turn the cakes back up so the tops are up and cool completely. Once the cakes are cooled completely, level the tops if needed. Wrap each cake layer with plastic wrap and chill in freezer for at least an hour before using. The cake layers can be stored for up to a few days wrapped once in plastic wrap and frozen. To store longer than a few days, wrap twice in plastic wrap, then in foil, and seal in a zip-lock bag. 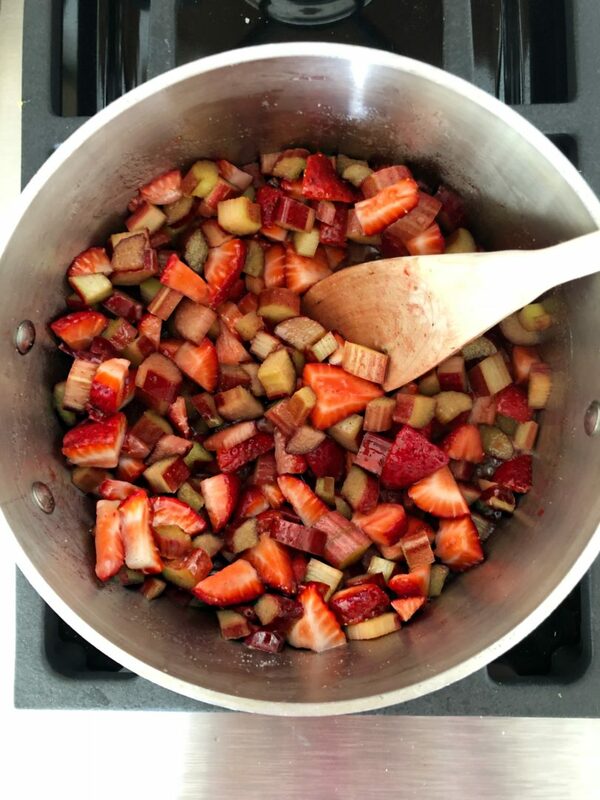 In a medium size saucepan, combine the strawberries, rhubarb, sugar and vanilla bean paste over medium heat. Bring to a boil. Once the mixture is boiling, reduce the heat to low and let simmer, stirring occasionally, until the fruit is tender. Let cool completely before using in the cake. Can be made ahead of time and stored in an airtight container for up to a week. Preheat your oven to 375 degrees F. Line a baking sheet with parchment paper. Set aside. In a medium size bowl, combine the flour, sugar, salt and cinnamon. Whisk to blend. Add the cubes of butter and rub in with your fingertips. The mixture will stick together like clumps. Mix in the oats and nuts. Bake for 8 to 10 minutes, stirring the crumble halfway through. Let cool completely before using in the cake. In the bowl of a stand mixer fitted with the paddle attachment cream the butter on medium speed for about 3 minutes, until the mixture is light and fluffy. With the mixer on low speed, slowly add the powdered sugar, followed by the heavy cream, vanilla bean paste, vanilla extract and dash of salt. Continue to beat the frosting on medium-high speed for an additional 5 minutes. Before frosting your cake, mix the frosting by hand with a wooden spoon to push out the air pockets. Place the first cake layer, top side up (crumb side up), on a cake board or cake plate. Using an offset icing spatula, spread a thin layer of frosting over the cake layer. This creates a barrier between the cake and fruit filling so the cake doesn't become soggy. Pipe a rim of frosting around the edge of the cake layer. This will help support the cake layers and prevent the fruit filling from spilling out. (You may even need to pipe a second time over the first rim you made - refer to the video above). Spread about 1/2 cup of the fruit filling on the cake layer. Sprinkle about half of the crumble over the fruit filling. Gently place the second cake layer on top of the filling and crumble and repeat steps 3 to 4. Place the final cake layer top side down on the second layer of filling. Freeze the cake for about 10 minutes to help set the frosting and filling, making it a bit more stable for when you frost. If the cake still feels wobbly, add a dowel to the center of the cake (or you can even use drinking straws for this). After the filling is set, use a small amount of frosting to apply a crumb coat around the entire cake. Freeze the cake again for another 10 minutes to set the crumb coat. After the crumbs are locked in, continue to frost and decorate the cake. *This amount of filling will make more than enough for the inside of the cake. 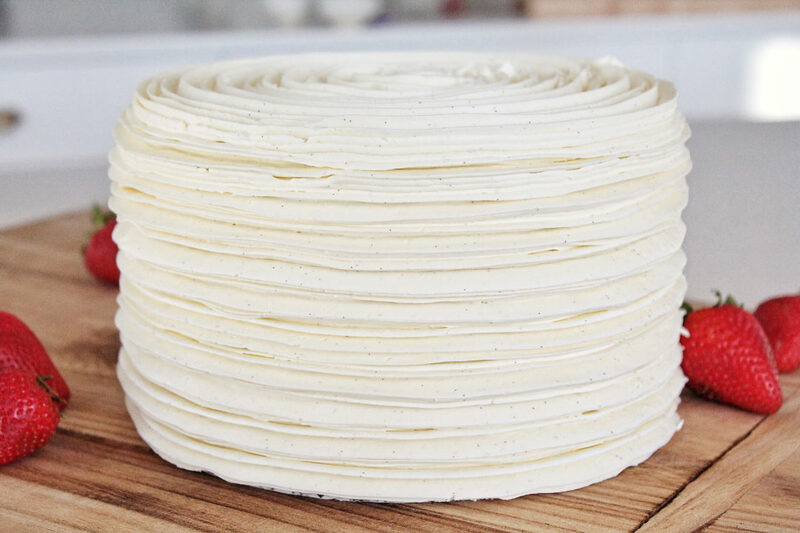 To make sure the cake is stable as you stack and frost, only add about 1/2 cup of the filling in between the layers. Serve an additional scoop of the filling and crumble with each slice of cake. 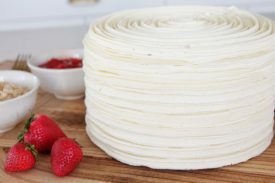 I’m planning on making this cake a four layer 8-inch, do you think the amount of filling and crumble in the original recipe is enough for another layer due to the fact that you had some additional left over or should I make more? 🙂 Thank you for all your creative work and amazing recipes, I just love watching your work on IG. Yes the filling and crumble will be enough, you’ll just need a little more batter. Maybe another 1/4 of the recipe. what would you recommend as a sub for vanilla bean paste? Could you sub the almonds for anything else? You could do another type of nut. © Cake by Courtney 2019. All Rights Reserved. | Design + Development by McKenzie Sue.